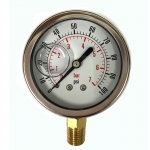 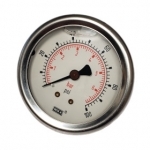 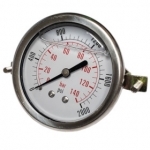 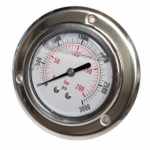 Northern Hydraulics stocks a full line of glycerine filled pressure gauges, from vacuum to 10,000 PSI. 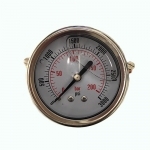 Stem mounting and center-of-the-back panel clamp mount options are available. 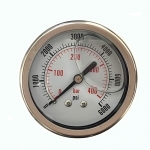 2-1/2" diameter display face is standard stock size. 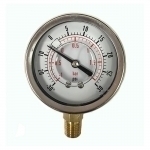 Glycerine filled gagues manufactured by Dynamic Fluid Components are an accurate measure for your pressure gauge needs. 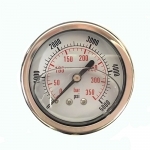 Gauges are built with a stainless steel case, a bronze bourdon tube and connection, and they also have a polycarbonate lens. 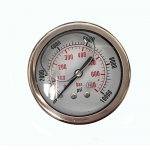 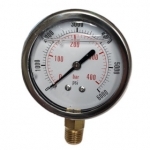 Gauges have a built in snubber and are designed with readings for both the PSI and BAR scales.